Although cherry prices have come down in the past few years, they are still purchased most by more affluent consumers. Use cherries to draw those consumers in to your store where you can then increase purchases of other items, as well. Cherries have a number of health benefits. Tart cherries have been shown to reduce inflamma-tion and reduce arthritis pain. Tart cherries also have been connected to cancer prevention and the prevention of memory loss. A diet that includes any type of cherries can help prevent cancer. Sweet cherries are a good source of potassium, which has been shown to help reduce blood pres-sure. 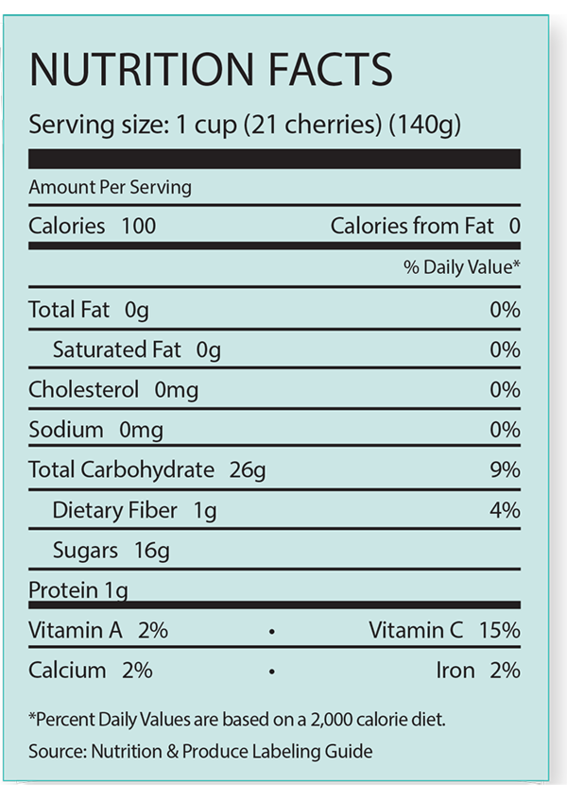 The U.S. Food and Drug Administration has approved the following nutrient content descriptors for cherries: fat free, saturated fat free, sodium-free, cholesterol-free and a good source of fiber. Cherry sales increased for the second year in a row, rising 15.2% in 2017. Pounds sold increased while per-pound prices dropped. Cherries are a popular fruit in baking, so cross-merchandise them with pie crusts, cobbler ingredi-ents, baking supplies, whipped topping, freezer bags, pancakes, yogurt and ice cream. Cherries are available in limited supplies most of the year, but promotable volumes are available in the summer and early fall. Make cherries a focus during those times of the year. Fall: Include cherries in back-to-school promotions as they are a tasty, nutritious snack or lunchtime side dish. Summer: Let cherries shine during the summer months. Include them in Memorial Day, Fourth of July and Labor Day promotions. Be sure to cross-merchandise them with pie fixings during those times. Promote cherries the rest of the summer as a quick snack for on-the-go families during the summer. You can also push them as a topping for those summertime ice cream sundaes. Promote cherries as soon as they hit the shelves in quantity to attract consumers who are waiting for cherry season to start. Cherries come in a multitude of varieties. Clearly label your display with variety information and some details about the best use and the flavor of each variety. Clamshells and bags keep a display tidy and reduce the chances of a slipping injury. Offer mul-tiple sizes to suit every consumer. Keep cherries refrigerated and away from sunlight and fans. Do not mist cherries. It will soften the fruit. Don’t stack clamshells on the display as cherries bruise easily. Make the most of cherry season so shoppers can easily find them. Give cherries a place near the front of the department when supplies are at their peak. Place cherries on display with other stone fruit like peaches and nectarines. Cherries’ red color contrasts well with the paler tones of those fruits. Add cherries to drinks for a unique flavor. Include sliced cherries in salads for a new and interesting flavor. Cherries are a natural in baked goods, including pies, cheesecake, breads and pastries. Cherry chutney is a tasty pairing for any type of meat. Use cherries as a plate garnish. Offer cherry topping for ice cream desserts. Temperature: 32 F, 0 C Relative humidity: 90-95% Mist: no Typical shelf life: 10 to 14 days Odor-sensitive. Sweet cherries may pick up off-flavors from shipping or storage with commodities that have strong odors. Modified atmosphere poly liners should be slit when product is received to eliminate gas buildup and off-flavors. Open the lids of cherry boxes stored in the cooler; good air circulation will slow spoilage. Don’t break cherry stems. Cherries with stems have a greater shelf life than those without. It is normal for rainier cherries to have some skin discoloration, slight scuffing or brown spotting, and it often indicates high sugar content. Cherries that are mahogany or reddish brown are considered to be the most flavorful. 37% of consumers said they purchased cherries in the past year. Consumers in the West were more likely than those in other parts of the country to purchase cherries. Shoppers making less than $25,000 a year were the least likely to buy cherries and half as likely to buy as those making more than $100,000.